The scientist colloquially known as Doctor Cyclops is on the brink of a big discovery. However, one thing is getting in the way, and his eyesight is deteriorating rapidly. He invites three renowned experts in their field to aid in his work. They make the long journey by donkeys to his remote location. As soon as one of them identifies his mistake Cyclops loses interest in the three, summarily dismissing them. Indignant at their treatment they refuse to leave. Cyclops appears to mellow, offering to show them his experiments which are powered by mined uranium ore. But he traps them in a radiation chamber and reduces them to a fraction of their normal size. He attempts to use them as controlled experiments, but they escape vowing to expose him. When you’re tiny though where is there to run to? The back story to this movie is at least as interesting as the feature itself. Many people will not have heard the name Ernest Schoedsack, but when I remind them that he also directed the all-time classic King Kong (1933), it will instantly be elevated to somewhere near the status he deserves. 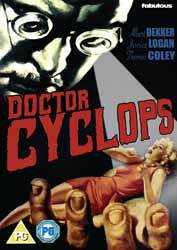 Doctor Cyclops is a 1950s B-Movie style production, except it is extremely well made and years ahead of its time in concept and execution. Bearing in mind this was 1940, not only is it in Technicolor (unlike many of the aforementioned 1950s films) but it was Oscar nominated for the excellent effects which Schoedsack made certain looked as realistic as possible. And talking of colour, it’s not only bright but vibrant to the point of creating more movement to the piece. Cyclops was played by Albert Dekker. Much as in retrospect he seems to be the ideal candidate for the part, he was blacklisted in Hollywood for some years as a result of criticising anti-communist speaker Senator McCarthy. Dekker was found dead in 1968 in a compromising and somewhat ritualistic setting. It’s easy to dismiss Doctor Cyclops as just another giant and small people mash-up; however, we need to remember that this came years before The Incredible Shrinking Man, Land of the Giants, The Borrowers, and all those others we have come to accept. It’s an enjoyable little piece with only two scripted moments bringing wry smiles of ridicule. To be hustled into the radiation room (with even the man looking after the donkeys invited in) they are proved to be naïve beyond belief. Even the most ‘green’ would recognise the danger of being locked in. The other situation is the raising and lowering of the drill in the grounds. The disappearance of Cyclops to periodically make a minor adjustment is merely a writing plot device for our pint-size heroes to instigate their escape and fight back. All in all, this movie – based on a short story by Henry Kuttner – is a well-crafted pleasure. I welcome its first release on DVD.